Peppermint tea is more than a fragrant, soothing beverage. Peppermint tea benefits your health in a variety of ways – from nausea and upset stomachs to headaches and nasal congestion. There’s a reason why peppermint tea is so beneficial to your health that the British regard it as a cure-all. And now you can experience it for yourself. Peppermint contains menthol which acts like an anesthetic on the nerves in your stomach. It helps alleviate nausea, stomach pains, and seasickness. Peppermint has also been used as a traditional remedy for bloating and flatulence. 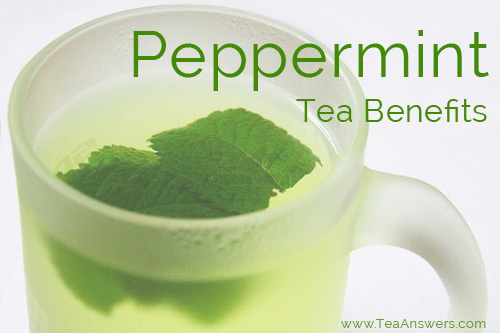 In addition to its benefits in helping your digestion, peppermint may also help suppress your appetite. If your traveling and are worried about an upset stomach or long waits between meals, you may want to take some peppermint teabags with you. They’re easy to stow in your carry-on for when your stomach might like a peppermint refreshment. The menthol in peppermint makes it a great inhalant to clear congestion in your nose and chest. Simply put some loose peppermint or a peppermint teabag in some boiling water and inhale the vapers. You can also leave the peppermint tea boiling on the stove, allowing the peppermint aroma to fill the air. Just make sure you remember to add water to the pot so that it doesn’t all evaporate and destroy your pot or worse. Used in this way, peppermint tea may also benefit laryngitis and bronchitis. When applied directly to the skin, peppermint can relieve pain. It has been used traditionally for everything from headaches to rheumatism. Simply place a warm peppermint tea bag on the spot where the pain is the strongest and enjoy the relief. What side effects and cautions do you need to be aware of? Even though it has numerous health benefits, it’s still important to exercise caution if you are at risk of experiencing peppermint tea side effects. While peppermint tea is generally considered safe for healthy adults, you should be careful of consuming it in large quantities. Before you add peppermint tea to your diet, you should speak to your healthcare provider to make sure it is safe for you. GERD or hiatal hernia: Peppermint is usually not advised for people suffering from GERD (gastroesophageal reflux disease) or hiatal hernias. While some people do experience improvement from these issues by drinking peppermint tea, other people experience increased heartburn and indigestion. Pregnant or planning to become pregnant: Peppermint is usually not recommended for women who are pregnant or planning to become pregnant because it may stimulate uterine blood flow. Please speak to your healthcare provider become consuming peppermint to make sure it is safe for you. Babies and children: Peppermint is generally regarded as being too strong for babies and children. The pleasant tingling feeling that adults experience when consuming peppermint is experienced as a burning sensation to infants and children. Please speak to your healthcare provider before giving peppermint tea to or applying it topically to infants and children. Be sure to read up on any possible side effects before you consume it or apply it topically. Discuss these with your healthcare provider before you consume or apply peppermint.